Being a global pop star, fashion icon and mother keeps Beyoncé pretty busy but she makes sure she takes some time out every September to celebrate her birthday and explore the Mediterranean on a luxury yacht. Beyoncé started this summer’s vacation in Naples where she met Galactica Star. The 65 metre motor yacht is clearly one of her favourite yachts to charter as she also vacationed on her in 2013. With a large international airport, Naples is a popular starting point for luxury yacht charters in Italy. It also has private jet facilities, although it is not clear whether Beyoncé opted to charter her own flight. Being a global pop star, fashion icon and mother keeps Beyoncé pretty busy but she makes sure she takes some time out every September to celebrate her birthday and explore the Mediterranean on a luxury yacht. Beyoncé started this summer’s vacation in Naples where she met Galactica Star. The 65 metre motor yacht is clearly one of her favourite yachts to charter as she also vacationed on her in 2013. With a large international airport, Naples is a popular starting point for luxury yacht charters in Italy. 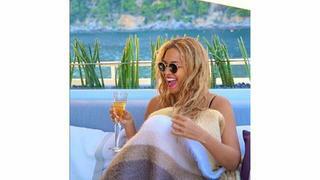 It also has private jet facilities, although it is not clear whether Beyoncé opted to charter her own flight. Beyoncé’s husband Jay-Z, daughter Blue Ivy and former band mate Kelly Rowland joined the singer on this summer’s luxury yacht charter and the group were next seen spending some time relaxing in picturesque Capri. Beyoncé seemed to make the most of chartering a luxury yacht on the Amalfi Coast and was spotted wandering around the streets of Capri — slightly bizarrely with bare feet — tucking into some Gelato. The group also enjoyed an al fresco meal in one of the town’s restaurants. Beyoncé is clearly a fan of Capri’s combination of natural beauty and luxury lifestyle as she also visited the island in 2013. Beyoncé’s husband Jay-Z, daughter Blue Ivy and former band mate Kelly Rowland joined the singer on this summer’s luxury yacht charter and the group were next seen spending some time relaxing in picturesque Capri. Beyoncé seemed to make the most of chartering a luxury yacht on the Amalfi Coast and was spotted wandering around the streets of Capri — slightly bizarrely with bare feet — tucking into some Gelato. The group also enjoyed an al fresco meal in one of the town’s restaurants. 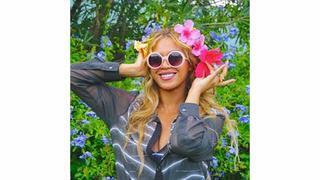 Beyoncé is clearly a fan of Capri’s combination of natural beauty and luxury lifestyle as she also visited the island in 2013. 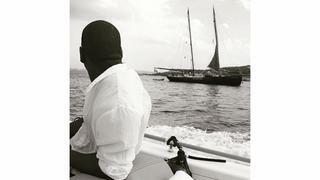 Beyoncé proved that Jay-Z and her were still “crazy in love” while they enjoyed some time aboard Galactica Star in Sardinia. The couple were snapped sharing a romantic kiss in front of the sea. Even though Galactica Star has a stunning aft-deck pool, Beyoncé spent some time on land relaxing in a pool at an undisclosed location, and helped Blue Ivy learn how to swim. 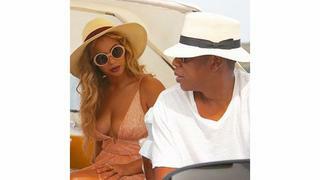 Beyoncé proved that Jay-Z and her were still “crazy in love” while they enjoyed some time aboard Galactica Star in Sardinia. The couple were snapped sharing a romantic kiss in front of the sea. Even though Galactica Star has a stunning aft-deck pool, Beyoncé spent some time on land relaxing in a pool at an undisclosed location, and helped Blue Ivy learn how to swim. Making the most of the flexibility that a luxury yacht charter can offer Beyoncé was next spotted at various locations in the Côte d'Azur including Antibes, Cannes, Nice and Cap Ferrat. They visited the Michelangelo restaurant in Antibes. A popular celebrity hang out, Magic Johnson also visited the restaurant during his Med luxury yacht charter. Like all vacations at some point they have to come to an end and Beyoncé left Galactica Star at Beaulieu sur Mer. The pop star and family are then thought to have flown back from Nice airport, which has one of the world’s most scenic runways. The end of Beyonce’s vacation has coincided with the launch of a new song, Runnin' (Lose it All), which has been produced by Naughty Boy and features her vocals. The video for the song is all underwater and it could be a track to add to your ultimate yachting playlist. Making the most of the flexibility that a luxury yacht charter can offer Beyoncé was next spotted at various locations in the Côte d'Azur including Antibes, Cannes, Nice and Cap Ferrat. They visited the Michelangelo restaurant in Antibes. A popular celebrity hang out, Magic Johnson also visited the restaurant during his Med luxury yacht charter. Like all vacations at some point they have to come to an end and Beyoncé left Galactica Star at Beaulieu sur Mer. The pop star and family are then thought to have flown back from Nice airport, which has one of the world’s most scenic runways. The end of Beyonce’s vacation has coincided with the launch of a new song, Runnin' (Lose it All), which has been produced by Naughty Boy and features her vocals. The video for the song is all underwater and it could be a track to add to your ultimate yachting playlist.